Even more good news. I’ve gotten the tutorial to operate in an Android emulator on my Mac. After all the updates, including an update to the Android emulator, I was able to launch the emulator as a Pixel 2 XL running Android 7.1 (API 25). Interestingly enough I couldn’t configure an emulator using any of the Pixel 3 smartphone’s; there were none in the AVD manager. The Apple emulator, by contrast, has the latest iPhone XS and XR variants. But at least it works and validates Flutter’s claim that the same application developed in Flutter will run on both iOS and Android. One quirk getting this to run. When I opened the tutorial back up, VS Code flagged the import of english_words.dart package. 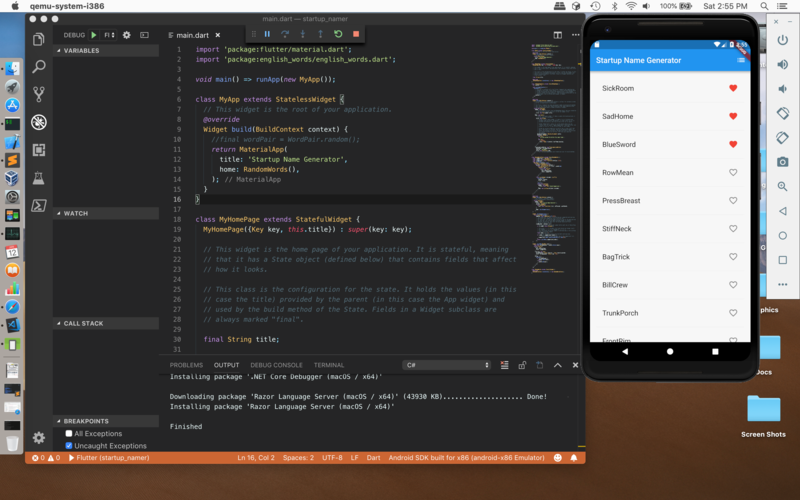 I had to re-run ‘flutter packages get’ in the tutorial folder and then restart VS Code. After that it was satisfied. You’ll note my biggest gripe is fixed now, the inability to apparently determine if the iOS (sub) toolchain was actually sane. Another minor but welcome fix was for the Android toolchain. The Android toolchain incorporates the Android SDK. In the past flutter doctor would complain that the Android licensing was inconsistent/incorrect. The workaround before this drop was to go and re-run sdkmanager (tools/bin/sdkmanager) and then re-run ‘flutter doctor’. That seemed to fix the Android toolchain issues. I’m not worried about the connected device because right now there is no connected device, and so this error message is correct. Again, these are welcome changes.
! Doctor found issues in 2 categories. Now the complete toolset is tracking Visual Studio (VS) Code, the editor/minimal IDE. 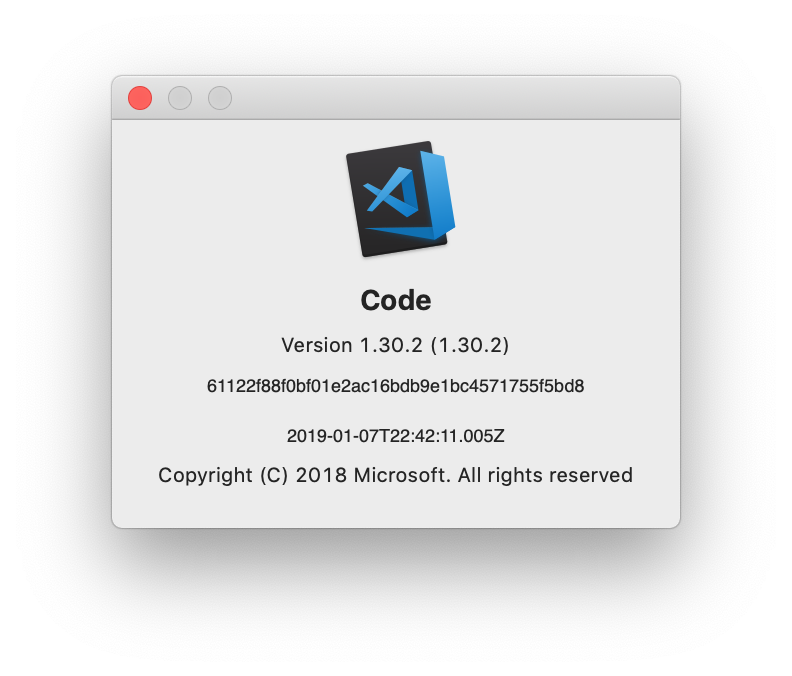 Thinking I needed to update VS Code, I checked my version of VS Code, and guess what? Yep, I’m running with the latest production release. A quick check showed that all the installed plugins were up to date as well. Then I re-ran ‘flutter doctor -v’ and got the verbose output. This is part of what I got on that run. Which is what I would have expected. I’m glad that they’re checking VS Code and the Flutter extension, but if there is a problem with the Flutter extension (or any other extension that Flutter depends upon) then they should surface that directly, rather than the current cryptic “You’ve got a problem” error message. Like the connected device message directly below it. I’m going back into using Flutter for app development instead of using it as an excuse to run tutorials. I’ve got at least two small projects in mind to use this tool on.